Liquid penetrant examination is one of the most popular Nondestructive Examination (NDE) methods in the industry. It is economical, versatile, and requires minimal training when compared to other NDE methods. 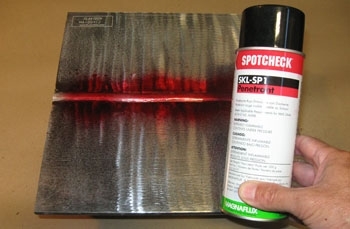 Liquid penetrant exams check for material flaws open to the surface by flowing very thin liquid into the flaw and then drawing the liquid out with a chalk-like developer. Welds are the most common item inspected, but plate, bars, pipes, castings, and forgings are also commonly inspected using liquid penetrant examination. 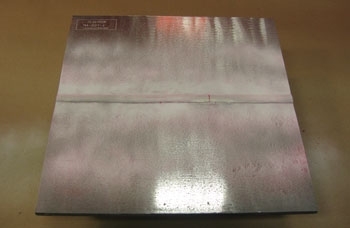 Over the years, liquid penetrant examination has been called many names: penetrant testing (PT), liquid penetrant testing (LP), and dye penetrant testing (DP). The American Society for Nondestructive Testing (ASNT) uses the name liquid penetrant testing (PT). The American Society of Mechanical Engineers Boiler and Pressure Vessel Code (ASME B & PVC) and the National Board Inspection Code (NBIC) use the name liquid penetrant examination (PT). The first documented use of PT was in the railroad industry. Cast railroad wheels were dipped in used oil, dried off, and then coated with powder chalk or suspension of chalk in alcohol. Once the wheels were dry, any oil stored in the flaw would bleed out into the chalk and be detected. This was called the oil and whiting method. The ASME Boiler & Pressure Vessel Code recognizes six different techniques of PT. They vary by type of penetrant and method of cleaning before applying a developer. The two penetrant types are either fluorescent or color contrast (dye) penetrant. They can then be used with any of the three methods of cleaning – water washable, post-emulsifying, and solvent removable. The most popular is dye penetrant that is solvent removable. This method is referenced throughout the article. The dye penetrant solvent removable method is most popular because it is low cost and very versatile. 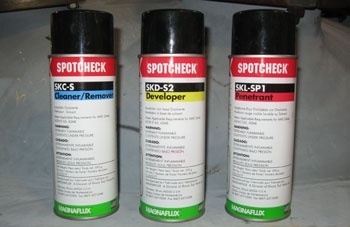 It typically comes in three aerosol cans – cleaner, penetrant, and developer. The cans can be purchased from welding supply distributors for typically $5 to $15 a can. For less than $50 you can have all the equipment you need to conduct liquid penetrant examinations. The aerosol cans are very versatile which allow them to be taken up ladders, inside boilers, down into pits, and into very tight places. Most nonporous materials (steel, stainless steel, cast iron, aluminum, brass, bronze, titanium, rubber, plastics, and glass) can be examined using PT. Porous materials (concrete, wood, paper, cloth, and some types of fiberglass if the fibers are exposed to the surface) should not be examined using PT. 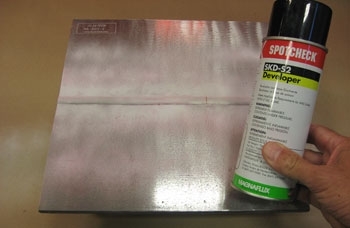 There are several advantages and disadvantages to using liquid penetrant examination. It is important to remember penetrant is a very thin liquid designed to seep into the smallest crack. Consequently, if an assembly has stitch welds or material not sealed by a weld, the penetrant will travel behind the welds and between layers of unfused material. Penetrant can be nearly impossible to remove from these areas. 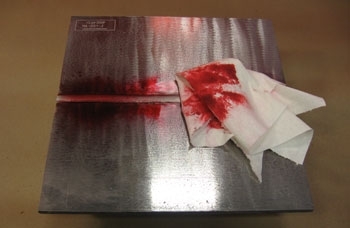 Trapped penetrant will cause defects in welds if further welding is done or will bleed out over time and contaminate paint and process fluids. For PT to be used on ASME Code construction or NBIC repair or alterations, a written procedure must be followed. This must comply with ASME Boiler and Pressure Vessel Code, Section V, Article 6, and address all essential and nonessential variables. Many liquid penetrant examinations are done for informational purposes only, and do not follow a written procedure. For instance, a written procedure does not need to be followed if a welder grinding out a weld crack for repair is using PT to ensure removal of the entire crack. However, if the PT is being done to comply with Code, the written procedure needs to be followed by qualified NDE personnel. This can range from grinding and wire brushing to merely wiping the part with a rag moistened with the cleaner/ remover. The surface needs to be free of dirt, rust, scale, paint, oil, and grease, and be smooth enough to wipe off the penetrant without leaving residue. 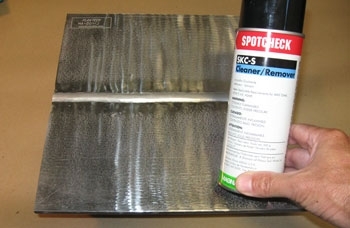 This is generally done by spraying penetrant from the aerosol can or applying it with a brush. A dwell (soak) time needs to be observed to allow for the penetrant to permeate into cracks and voids. This is typically 5 to 30 minutes but should never be long enough for the penetrant to dry. The penetrant manufacturer’s recommendations and written procedure should be followed. All penetrant should be removed with clean, dry, lint-free rags until thoroughly clean. The part or material should be rubbed vigorously until the penetrant is not visible on the dry rags. Next, cleaner/ remover should be sprayed on another clean, dry, lint-free rag and used to vigorously rub the part again until there is no penetrant visible on the rag. A thin, light coating of developer should be sprayed on the part being examined. A dwell time needs to be observed to allow time for the dye to exit the flaws and create an indication (flaw) in the developer. The dwell time for developer is typically 10 to 60 minutes. The developer manufacturer’s recommendations and written procedure should be followed closely. It is critical to examine the part within the time frame designated in the written procedure. 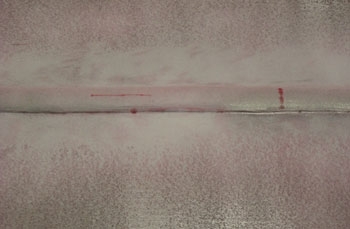 Length of an indication can grow over time as penetrant bleeds out, causing an acceptable indication to be a rejectable defect. Length of indication is measured for evaluation, not length of the flaw. Here, the two linear indications are rejectable defects. The round indication is nonrelevant. The part needs to be cleaned to remove all developer after it has been evaluated. ASME Section V also requires the dye penetrant solvent removable method be evaluated with a minimum light intensity of 100 foot candles on the part surface. 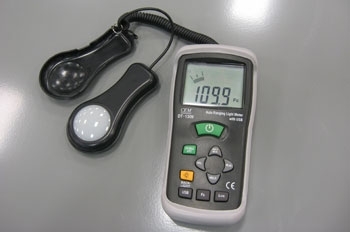 Proper quantity of light must be verified using some type of light meter. Once boilers and pressure vessels are in service, PT can be a very valuable tool. The NBIC recommends PT for examination of: firetube boiler tube sheets to find leakage around tubes, external inspection of weld joints, evaluating components subjected to fire damage, historical boilers, fiber-reinforced thermosetting plastic pressure equipment, Yankee dryers, and pressure vessels in liquefied petroleum gas (LPG) service. During inservice inspections, PT should also be used in areas suspected of defects. 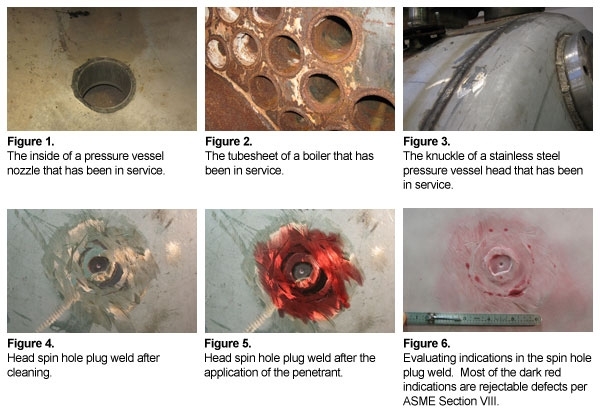 These include, but are not limited to, nozzles (see Figure 1), tubesheets (see Figure 2), knuckles of heads (see Figure 3), and head spin hole plug welds (see Figure 4). To effectively use liquid penetrant on the tubesheet in Figure 2, an extensive amount of work would need to be done. All rust and scale would need to be removed so the penetrant could be cleaned off. Rolled, unfused tube ends would also bleed out dye and cause false indications. The head spin hole plug weld looks acceptable to the naked eyes, but shows many defects once it has been liquid penetrant examined (see Figures 5 and 6). In conclusion, PT can be a very valuable tool during new construction and inservice inspections. PT does have limitations and is not the best method for all applications. However, for quick, low cost examinations in any location, PT is often the best choice of NDE methods.